Seamlessly transition from ideas to completion. 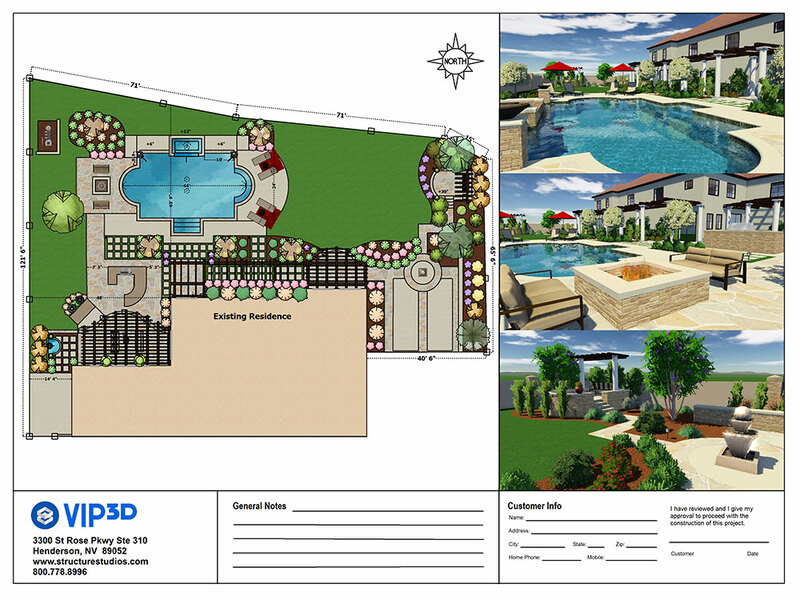 Designing with professional pool and landscaping design software means it’s a snap to get the paperwork for even complex, sophisticated designs in order quickly. Print, export, and share your build-ready plans with the construction design software — at the scale you need, with the precise information you need, to simplify the approvals process and make sure your team is ready to go. With Smart Data, the info you need is instantly ready for you. 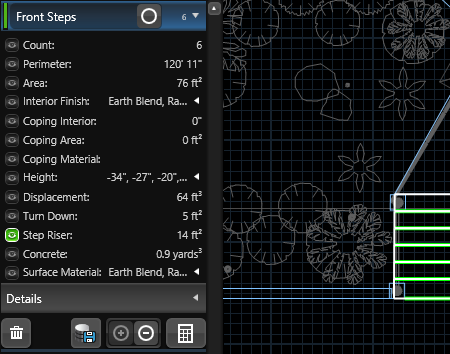 Tackle cumbersome hardscape calculations, from step risers to turn down measurements with our construction design software. Get deeper insight into projects with rebar calculations. Calculate even the most complicated volume measurements, including dirt displacement, concrete yardage, and gallonage. 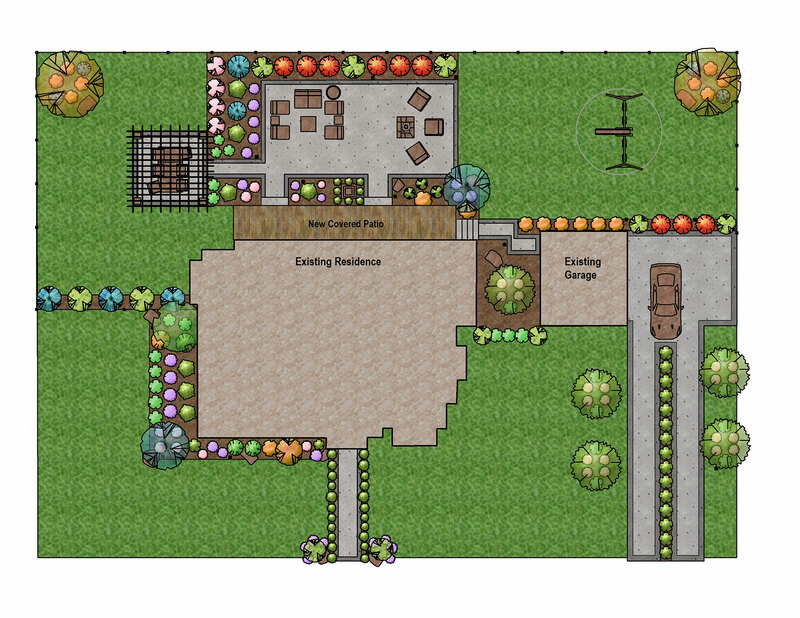 The construction software features you need, from the only pool and landscaping design software that handles the calculations for you. Real-time calculations make estimating projects easier than ever before. The construction design software features allow calculations to update automatically and instantly on construction pages, saving hours of work. Change requests become painless, instead of a time-consuming hassle, when changes are calculated in real-time as you work. The numbers you need, with unprecedented ease. Add perspective to your plans. 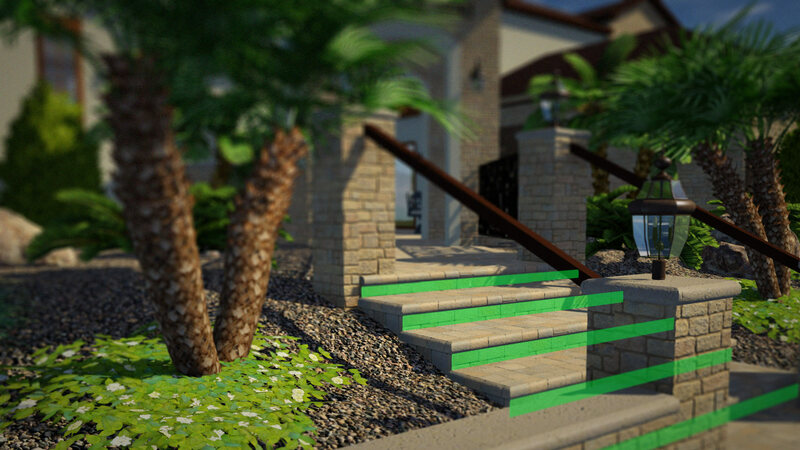 Share more advanced, more dynamic results than is possible with traditional 2D construction plans. Incredibly detailed 3D plans reflect precisely what you want, giving both your clients and your construction crew better insight into your collaborative goals. 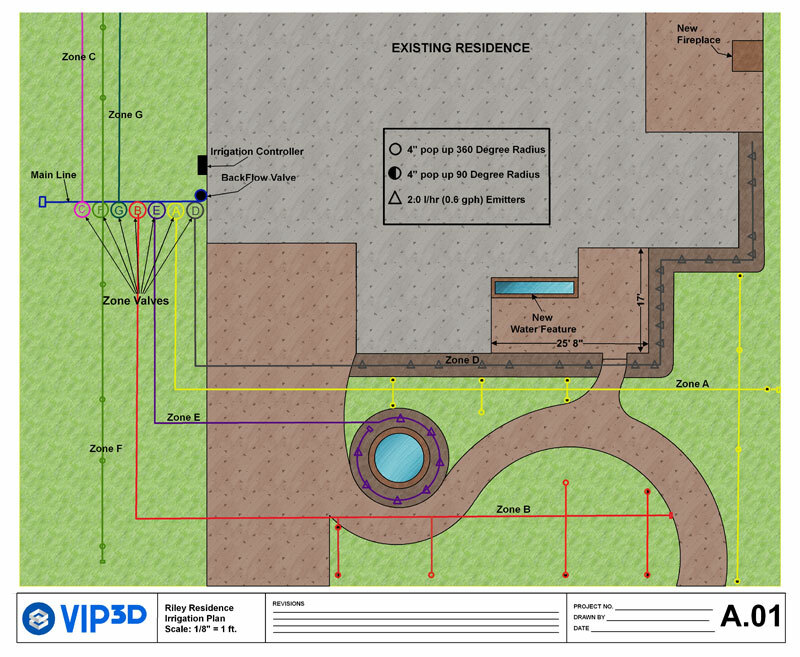 For construction elements that simply can’t be communicated through 2D line drawings or cutouts, using pool and garden design software to offer 3D perspectives of design elements ensures your crew builds precisely to your specifications. Scan, design, print. Approvals, made easy. Getting paperwork in order for approvals has never been easier. 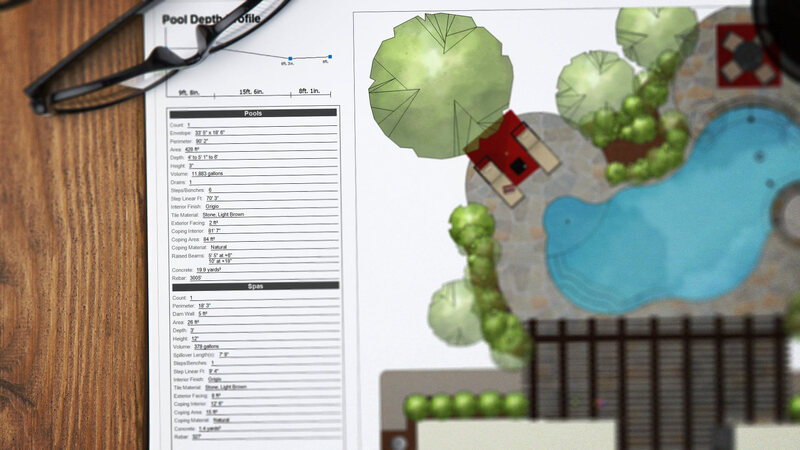 Take advantage of the powerful construction tools that your Pool and Landscaping design software has created for you, and you can quickly print the completed site plans you need — ready for approval with your proposed property changes. 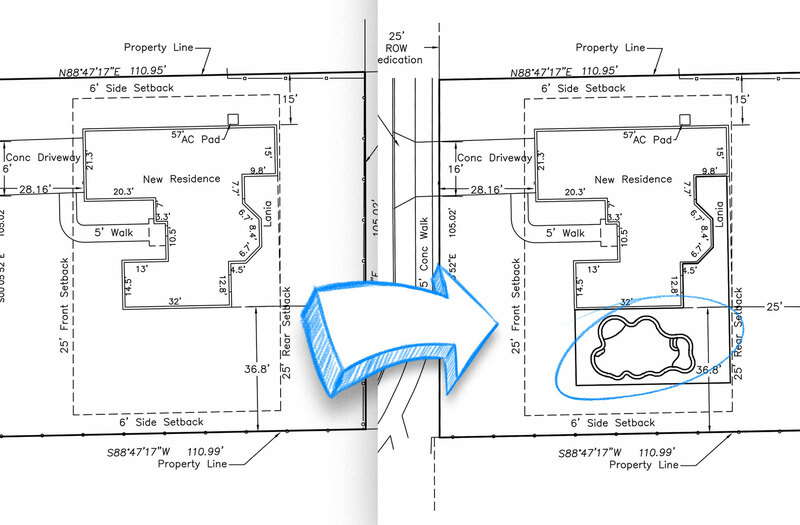 Simply scan in paper site plans, add your design, and print. You can even import a site plan or property surveys from AutoCAD with the construction design software. 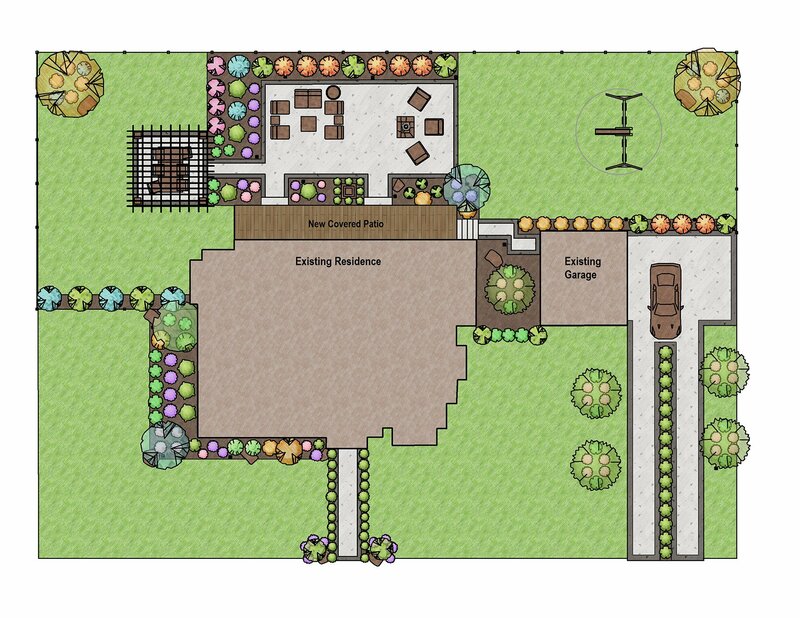 When you need to create the most incredibly precise, accurate, and detailed custom projects, the right landscape design tools mean the difference between good enough — and absolutely spectacular. With 3D Measurements, you can now share an extra level of detail with your clients and installers, making certain that the design you’ve created is exactly right. 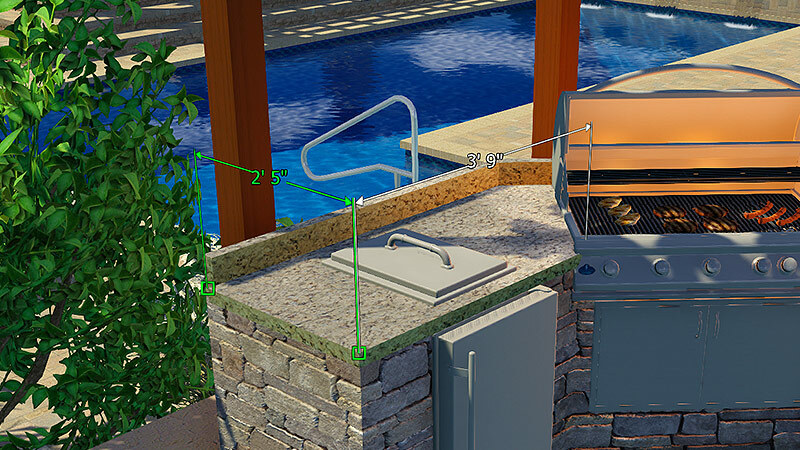 Measure vertical components, show your installers exactly how thick the counter lip needs to be, and use 3D Measurements to keep everyone in the project on track. 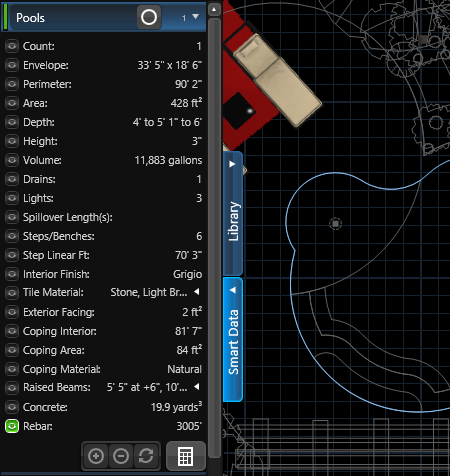 Put the power of pool and landscape design software to work and get precise, accurate measurements for your installers — in just one click. Any project, any size, any scale. With the new Triangulation and Centerline Rulers, sharing precise measurements becomes completely effortless: you can now layout pools and hardscape in one easy click. 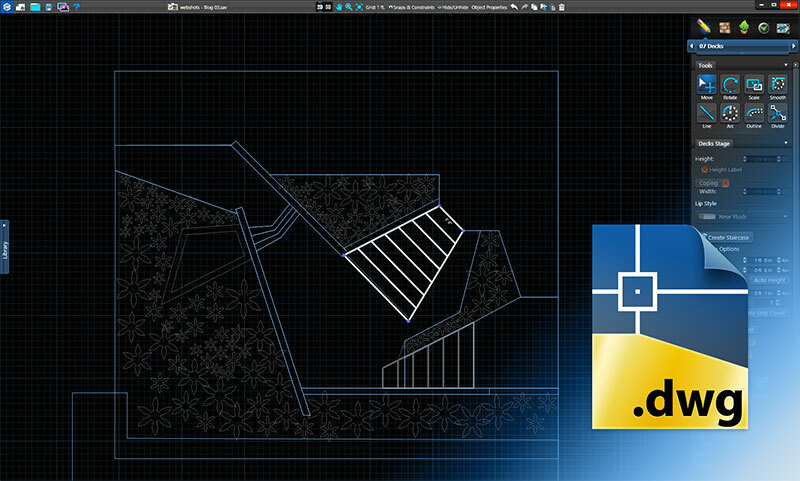 Instant, automatic calculations mean you no longer need to painstakingly, manually measure your intricate designs. Just one click is all it takes to get the detailed measurements your team needs to build your design exactly to your specifications. 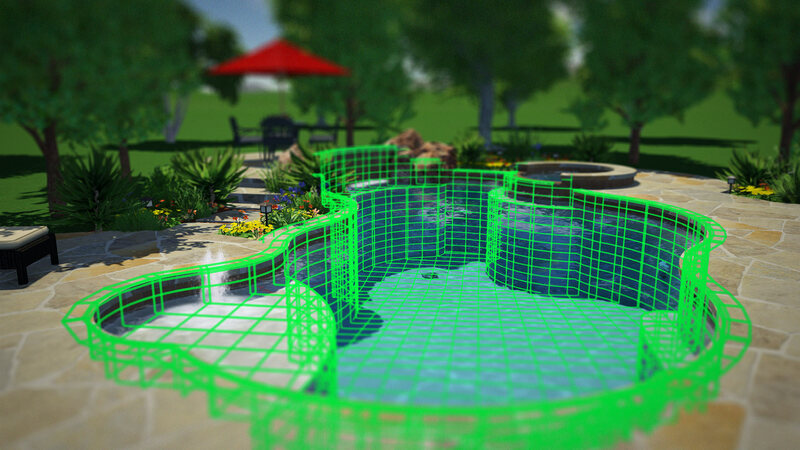 And because the Triangulation and Centerline tools are fully integrated into the most powerful pool and landscape design software — you can instantly edit, adjust, (even fully rotate) your automatic measurements to achieve the perfect results your clients want. 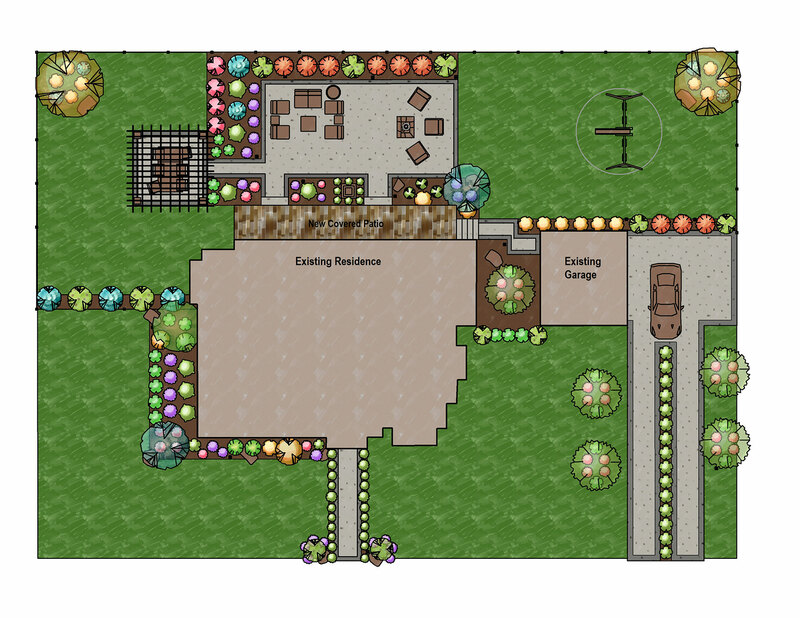 Export your outdoor living designs to share them easily with engineering firms, architects or anyone else who still uses AutoCAD. Go beyond simple black and white plans. It’s never been easier to bring your plans to life. 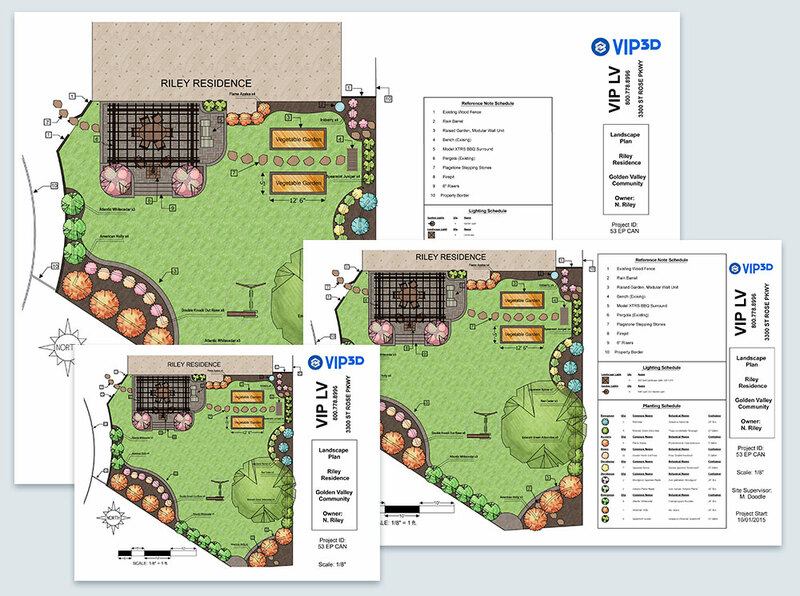 Built for the needs of professional designers, VizTerra reveals itself as the best landscape design software with powerful options that let you experiment freely to express your design vision. Gorgeous, hand-drawn fill patterns make it easy to create the stunning look you want. Water Colors, Markers, Colored Pencils and Modern artistic fills are built-in so you can enhance your design with just one click. And VizTerra’s seamless tools let you see your construction plans with the same materials you assigned in the 3D materials stage, automatically. You can adjust any color to match the exact look you need. Keep your focus on your design. Let the plant legend analyze your work for you. 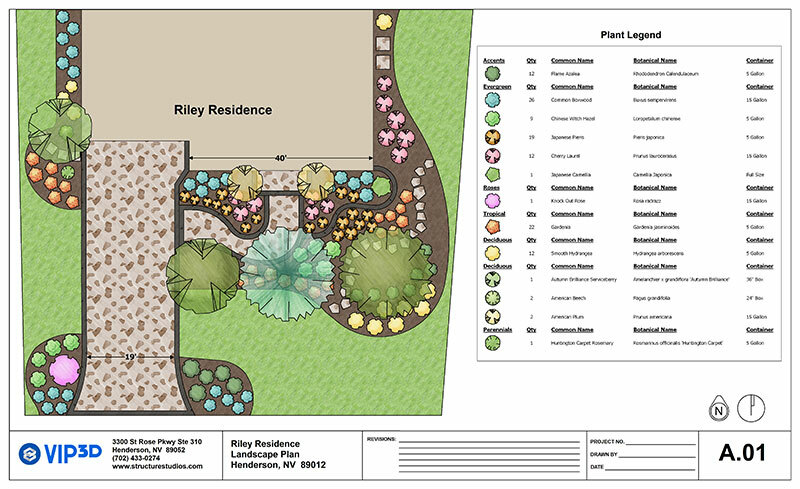 The pro landscape design software’s powerful and customizable plant legend tool automatically categorizes plant and object types, keeping track of any tree, bush, flower, or object you place in your design. And if you add more trees or objects, or if you customize the symbols or names, the legend updates automatically. 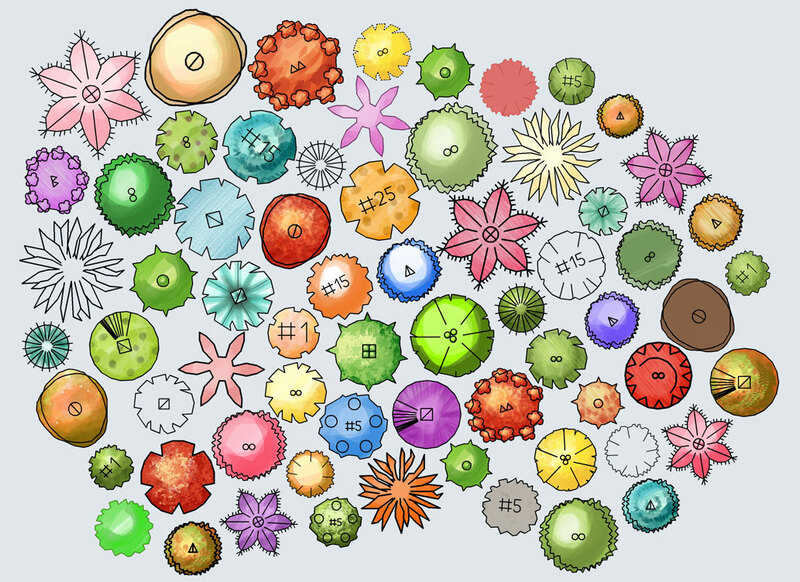 Choose from the library of plant and object symbols or customize your own. It’s simple to create and edit plant symbols, colors, and container sizes that will make your construction plans easy for your team to interpret. Draw irrigation lines and mark the location of sprinkler systems. You can easily select your irrigation lines for a total length calculation. With one simple click, you can change the scale of any design. Choose any scale you need, including ⅛” or 1/16” engineering scale. When you’re ready to print, simply select any paper size, from standard 8.5”x11” to plotter size.